Lately I've been feeling a bit sluggish. I'm not sure if it's because Perth has had a 63-day heatwave or all my baking has got to me - I'm going with a mixture of both. Regardless, I've had a craving for light healthy food, in particular soups. It's not really soup weather but I've already started my research on new recipes. The first recipe that came to mind was Drunken Chicken made by MasterChef Season two contestant Alvin. I remember watching him make it on TV, and in particular the judge’s response to it - they loved it. So I took the recipe and went to the shops. Perth is seriously lacking in good produce - I couldn't find Shaxoing wine in 4 shops! So after buying a chicken, vegetables and noodles I checked my favourite Asian cookbook Simple Chinese Cooking by Kylie Kwong. I bought this book years ago and have made numerous recipes from it. 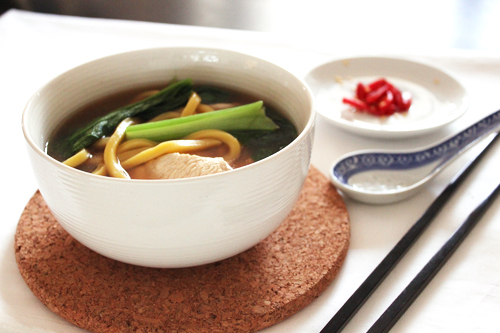 I decided on two recipes that linked - Chinese Chicken Stock and Chicken Noodle Soup. The stock was refreshing and light which made the soup very lovely. I had to add a bit of extra soy as there wasn't in my opinion enough salt. I also, in my rushed state, forgot to add the mushrooms I bought for this dish. Feel free to add or subtract an soup ingredients you like. Rinse the chicken to clean. Place all ingredients in a large pot and bring to boil, then reduce to a gentle simmer. Skim away any impurities. Continue on a gentle simmer for 2 hours or until you have a lovely fragrant stock. Remove stock from stove and allow to cool. Strain the stock through a muslin. Stock can be stored in the fridge for up 3 days or frozen for 2-3 months. Bring the stock to the boil in a large pot. Add the soy sauce, ginger, oyster sauce and sugar and stir until combined. Reduce the heat to a gentle simmer and add the drained noodles and cook for 30 seconds. Add the vegetables and chicken and continue cooking for a further 2 minutes. When chicken is cooked, add sesame oil then remove from the stove. Serve in a bowl, along with the spring onions and chilli. Congratulations on such a lovely blog! All your food looks beautiful and your from Perth! I'm from Perth but currently living in Norway. So looking forward to trying some of your recipes! P.S You should try haianese chicken rice at the food hall opposite the Fremantle markets. Absolutely delicious, and cheap. I am doing this tomorrow! Great idea.